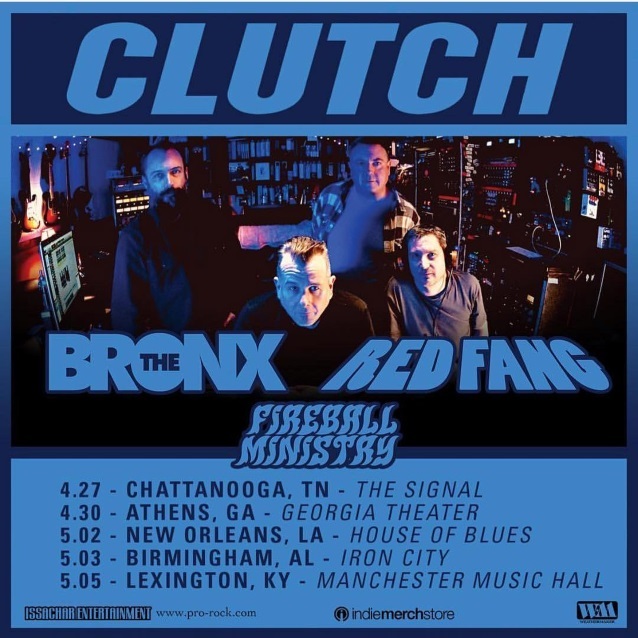 Maryland rockers CLUTCH have just announced a string of spring headline tour dates starting on April 27 in Chattanooga, Tennessee. Support on the tour will come from THE BRONX, RED FANG and FIREBALL MINISTRY. Fan club pre-sale tickets will go on sale today, Tuesday, January 30 at 2:00 p.m. and will be available through Thursday, February 1 at 10:00 p.m. Tickets will go on sale to the general public Friday, February 2 at 10:00 a.m. at local outlets as well as at Pro-Rock.com. CLUTCH has just completed recording its new album at Sputnik Sound studio in Nashville, Tennessee with producer and engineer Vance Powell (THE WHITE STRIPES, RED FANG). Guitarist Tim Sult recently told The Advocate that he was excited about finally working on the follow-up to 2015’s “Psychic Warfare”. “They’re my favorite songs,” he said of the new material. “At this point, we probably have more songs than we’ve ever had before going into the studio. The material is a little heavier. It has a more doomed-out vibe and feel. We’re going to record more live. “Psychic Warfare” debuted at No. 11 on The Billboard 200 chart after shifting 26,000 equivalent album units in the week ending October 8, 2015. The disc was released via CLUTCH‘s own label, Weathermaker Music. 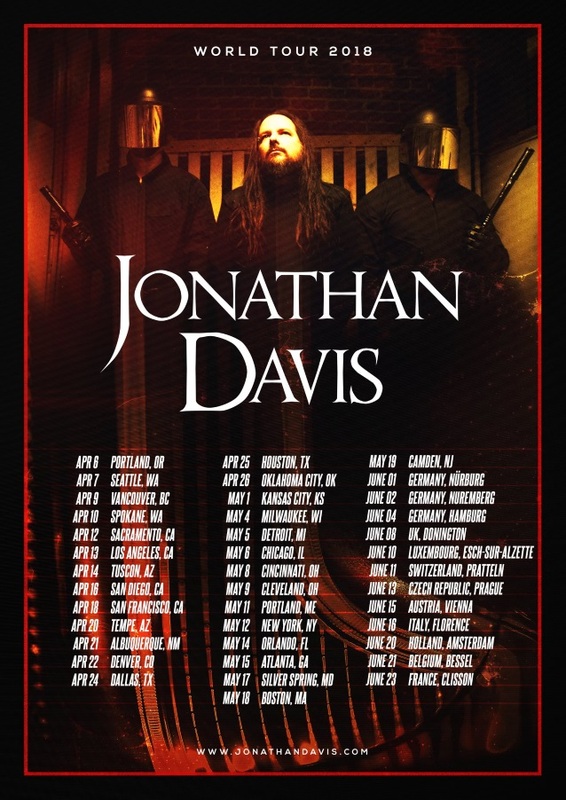 KORN frontman Jonathan Davis will embark on a solo tour in early April. The trek, which will run through the end of June, will include a number of European festival appearances. Davis will be promoting his new solo single, titled “What It Is”. The song is included on the soundtrack to a new film called “American Satan”, which came out on January 26. Davis has also been preparing a new solo album that is expected out this summer via Sumerian. The new music represents a natural step for the Bakersfield, California singer, songwriter, composer, producer, and multi-instrumentalist. Davis quietly compiled ideas for what would become this solo effort beginning back in 2007. Writing and recording on the road, he personally contributed guitar, keys, and anything else he could get his hands on to the record. Moreover, the music was primarily recorded live, a departure from KORN‘s heavily calculated, meticulous, studio approach to creation. This August marks the 20th anniversary of KORN‘s 1998 breakthrough album “Follow The Leader”. Guitarist Brian “Head” Welch indicated in a recent interview that the band is mulling over plans to celebrate that milestone. The classic-era lineup of the horror punk outfit MISFITS — Glenn Danzig, Jerry Only and Doyle Wolfgang Von Frankenstein — will play its first show in New Jersey in 35 years on Saturday, May 19 at the Prudential Center in Newark. Support at the show will come from SUICIDAL TENDENCIES and MURPHY’S LAW. Citi is the official pre-sale credit card of the reunited MISFITS. As such, Citi cardmembers will have access to purchase pre-sale tickets beginning Tuesday, January 30 at 10 a.m. EST until Thursday, February 1 at 10 p.m. EST through Citi‘s Private Pass program. For complete pre-sale details visit citiprivatepass.com. Ticket prices starting at $49.50 (not including applicable service charges or fees) go on sale to the general public beginning Friday, February 2 at 10 a.m. EST at Ticketmaster.com. MISFITS played two historic reunion concerts in 2016 at Riot Fest in Denver and Chicago that drew rabid fans in droves from all over the world and shattered attendance records at the festivals. More recently, MISFITS played two reunion shows at the end of December in Los Angeles and in Las Vegas. 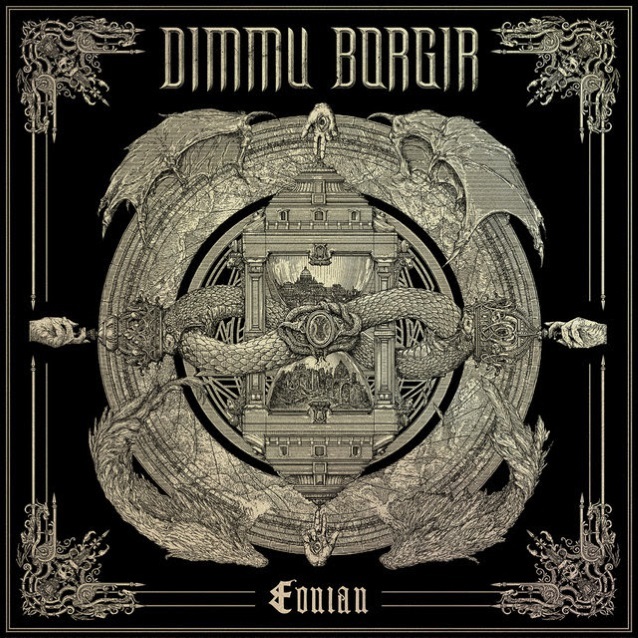 Norwegian symphonic metallers DIMMU BORGIR will release their new album, “Eonian”, on May 4 via Nuclear Blast. On February 23, DIMMU BORGIR will unveil the album’s first single, “Interdimensional Summit”, which will be released as a seven-inch vinyl EP, providing a first taste of the upcoming album. DIMMU BORGIR‘s latest release was the “Forces Of The Northern Night” DVD, which was made available in April 2017 via Nuclear Blast. The set contains two of the band’s live performances: their legendary show in Oslo, presenting DIMMU BORGIR on stage with the Norwegian Radio Orchestra and a bombastic choir, as well as their entire performance at Wacken Open Air festival in 2012 in Wacken, Germany with almost a hundred musicians on stage. Norwegian black metallers SATYRICON will return to U.S. shores for the final time this spring. The tour starts May 13 in Los Angeles, California and runs through May 30 in Austin, Texas, with two stops in Canada. 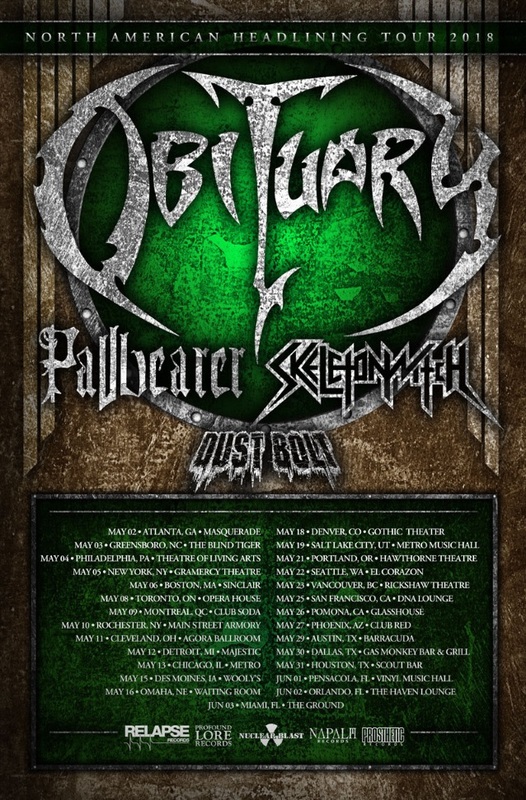 INQUISITION will provide support on the tour. A complete list of dates can be found below. The run also includes a headline appearance at the Maryland Deathfest. SATYRICON‘s latest album, “Deep Calleth Upon Deep”, was released last September via Napalm Records. The disc was recorded in Oslo, Norway and Vancouver, Canada, during early 2017 and mixed together with revered studio guru Mike Fraser (who previously worked on SATYRICON‘s 2006 album, “Now, Diabolical”). The “Deep Calleth Upon Deep” front cover is an obscure drawing from 1898 by perhaps the greatest Norwegian artist of all time, Edvard Munch. SATYRICON drummer Kjetil-Vidar “Frost” Haraldstad told “The Jasta Show” that “Deep Calleth Upon Deep” “is an album that we have been really working a lot with for a long time. It’s all about getting the right expression for each and every song,” he explained. “It has never been anything that we’ve discussed in the band, but at least I personally feel that every song has a life of its own, a very strong and unique identity,” he continued. “This album is really about giving life to those eight songs that constitute it. 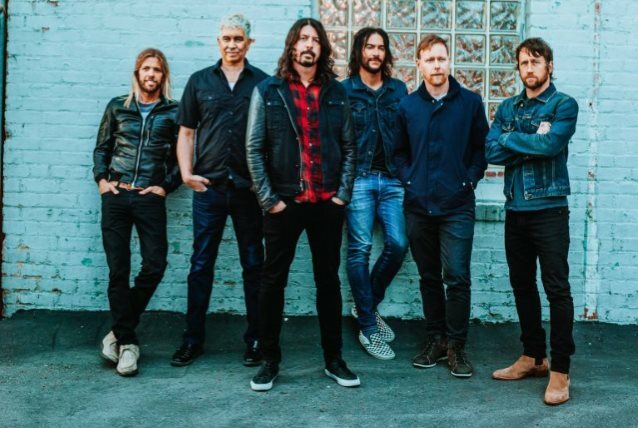 FOO FIGHTERS‘ “Concrete And Gold” tour has added seven new headline dates to its North American itinerary. The North American leg of the tour supporting the band’s “Concrete And Gold” album (Roswell/RCA) has further expanded its 2018 itinerary with a run of new arena headlines beginning October 8 at Talking Stick Resort Arena in Phoenix, Arizona and running through October 18 at the XCel Energy Center in St. Paul, Minnesota. Tickets for the new dates are on sale to the public as of Friday, January 26 at 9 a.m. local time (with the exception of Detroit, which goes on sale Thursday, January 25 at 11 a.m. local time). Capital One cardholder and FOO FIGHTERS fan pre-sale tickets will be available as of Tuesday, January 23 at 10 a.m. local market time. Pre-sale tickets will be available until Thursday, January 25 at 10 a.m. local market time or until they are sold out. Pre-sale tickets are limited to (4) tickets per card. While supplies last. The tireless FOO FIGHTERS have just begun 2018 in style, with their just-underway stadium tour of Australia and New Zealand. The first U.S. leg of the “Concrete And Gold” tour wound down 2017 by storming through sold-out arenas in Richmond, Greensboro, Cincinnati, Sioux Falls and more.